Happy Monday!! I’m back. So sorry for the long pause but my son was very sick for several days which took all of my time and energy waking up in the middle of the night, disinfecting, washing clothes and sheets, you know the drill. Momma had to ramp up to meet the demands! So something had to give and my crafting took the hit. My first layout with the October kit from Cocoa Daisy. But I am back and cranking out projects to wrap up the October kit. I know the November kit is on it’s way so I am really hustling to catch up. Anyway, welcome to my blog series, “Confessions of a Scrapbook Kit Hoarder“. If you haven’t already, please read The Intervention so you can understand the inspiration for this craft adventure. Creating this layout with some of the papers from the October kit began as a challenge but now I like how it turned out. The colors in this kit are very muted. I am coming off of summer colored projects so I had to embrace the less vibrant colors and these photos seemed to complement them well. I took pictures of my son playing in the leaves a few weeks back and had to create a layout to capture his pure joy with nature. I love that he sees all those leaves as something that must be investigated and played for some time in. I love them when they are on the trees but knowing that raking needs to be done when they fall, I am not as thrilled as he is about them. I know geotags are big right now and have not used them before so it was fun using the yellow heart geotags in this layout. I also snagged some old October Afternoon labels to include a little journaling. 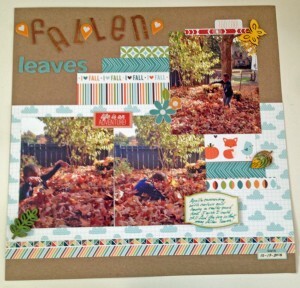 With each scrapbook layout I do I feel the cobwebs falling away. As I said before it’s been over a year since I made any scrapbook pages so I am a little rusty. Hope you all had a great weekend and I will see you on Wednesday with another project from this kit. Very nice! Welcome back to scrapbooking! What is a geotag? Thank you Joan! I am happy to be back. A geotag is a way of marking a location. For example, when you use a smart phone to take a picture it can capture the location information where the photo is taken. A more thorough definition can be googled but that is the basic idea. 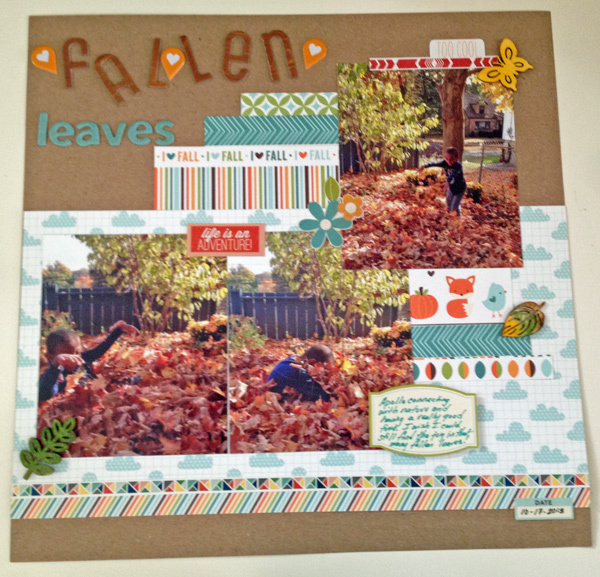 I absolutely LOVE the fall and you’ve captured it beautifully in this layout. I know what you mean about the cobwebs. The more I create the more creative I feel. I hope your son is feeling better. It is no fun when our little ones are sick. I’m looking forward to some more of your beautiful creations. Oh April I wish I could have gone on your craft retreat. I have one coming up in March and every time I think of it, I can’t help but smile. Wow, 32 pages is impressive. I knew we were ‘birds of a feather’ but especially after you mentioned that you made two of the anniversary albums. I am the same way, I always want my own copy of my gift projects. That is a blessing to be witnessing your parent’s 50th wedding anniversary. Apollo is well again and back at school. Hope his first day back goes well. Well on to some craftin. Thanks for the visit.